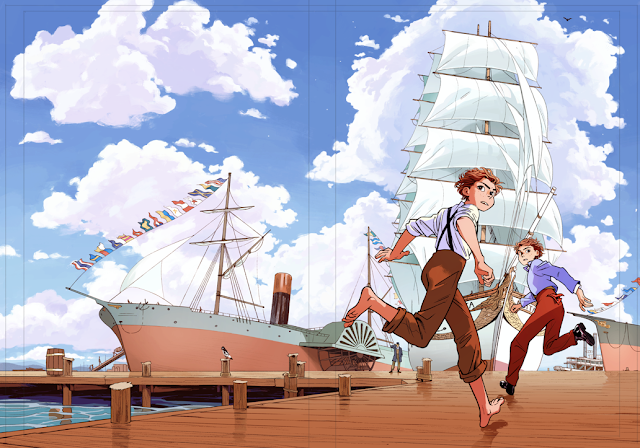 The last phase of Compass South was the final edits and drawing the cover. The cover for book 1 was a collab between ideas I presented and ideas from Hope and our editor. We wanted to show the two main characters front and center, but I wanted to show their full figures rather than floating heads or cutting them off at the waist. I also wanted to show something scenic. 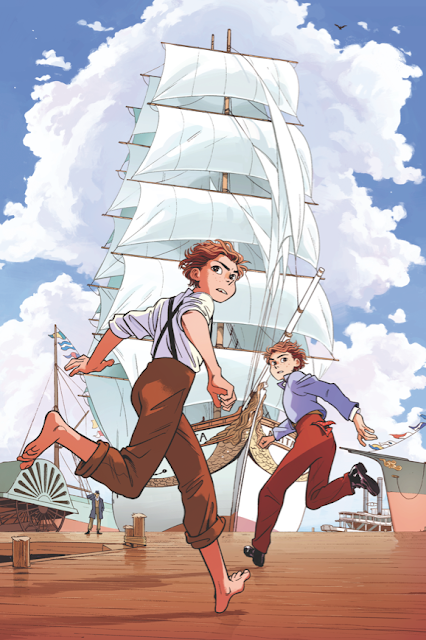 The image became a wraparound cover, a full scene that had a lot of sky, but with Alex and Cleo effectively framed front and center. This was a scene straight from the story--Alex and Cleo running across the wharf in New Orleans, before they are separated. It was tricky to get their positions right--they had to look convincingly alive in the space, while still evoking the drama of their "hero" running poses. The main ship from the story--the Anita--needed to be shown in its full glory as well. 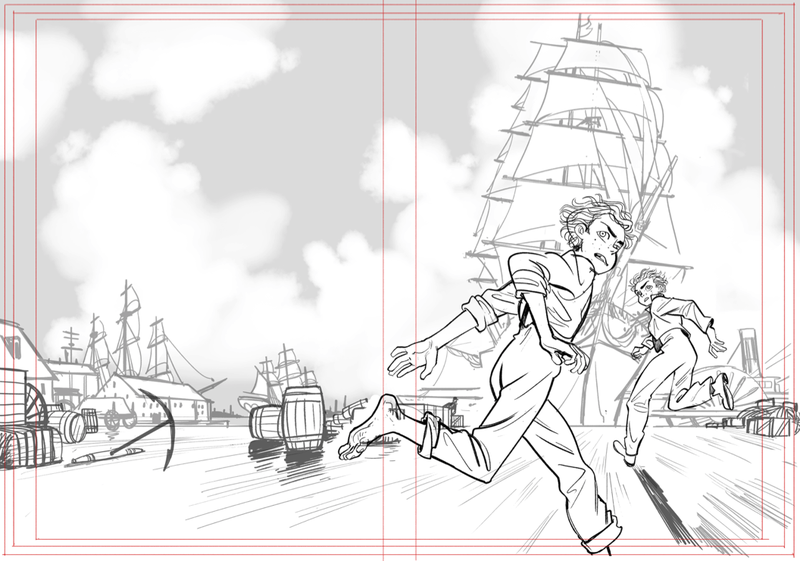 I had started this book knowing next to nothing about drawing ships. Now I was campaigning to put one right on the cover, to show viewers how majestic and beautiful they could be. The gracefulness and power of ships plays a big role in the Four Points story. I made sure to also add in plenty of flags, though these aren't seen in the book. But flags are colorful and celebratory. I'm saying “Hooray! 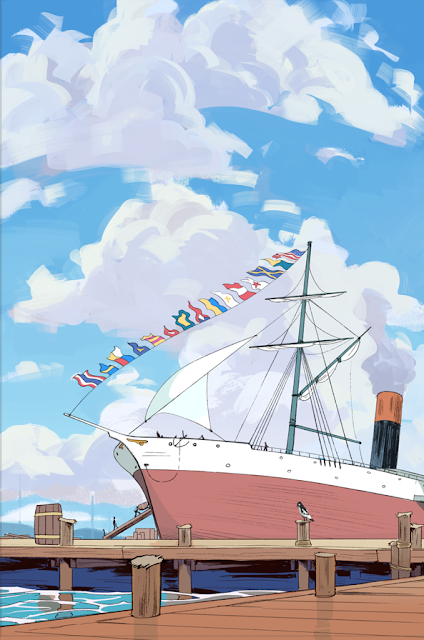 Look at this pretty book!” Some of the flag designs were taken straight from the many ship flags seen in Howl's Moving Castle (a favorite film of mine). And that’s our story! 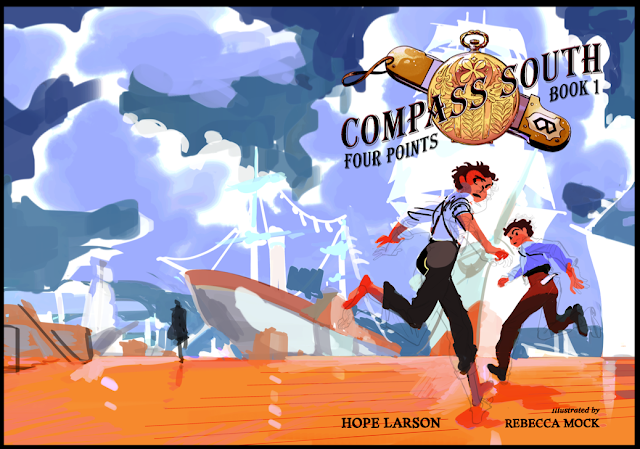 I hope you pick up Compass South, even just to admire the cover, which I’m pretty proud of. Enjoy! 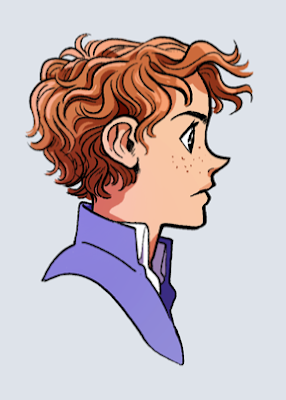 Rebecca Mock is an illustrator and comic artist. Her work has appeared in various publications including the New York Times and The New Yorker. She is co-organizer of the Hana Doki Kira anthology. Compass South is her first book. Visit her online at www.rebeccamock.com. July 2nd — Watch. Connect. Read.